Last couple of weeks there has been a frenzy of crow activity to get their nurseries ready. 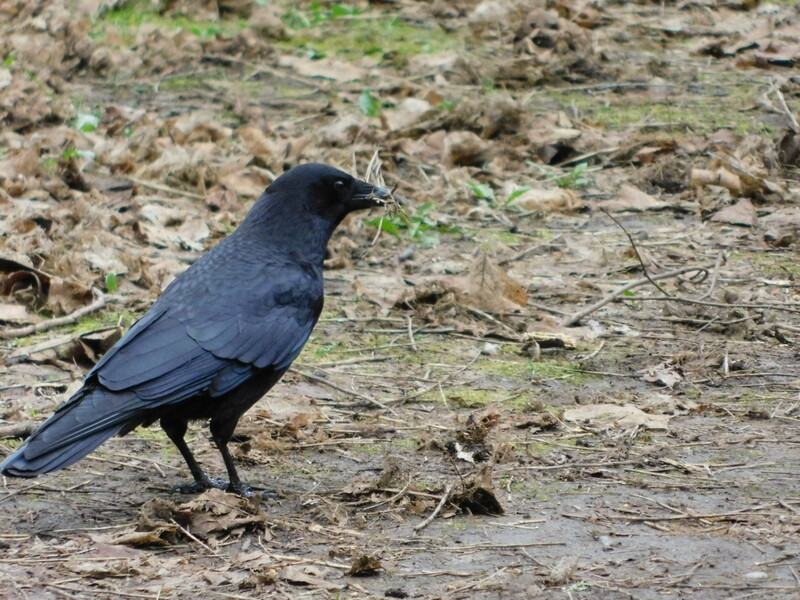 One of the biggest clues to where a crow is building is to follow the sticks. 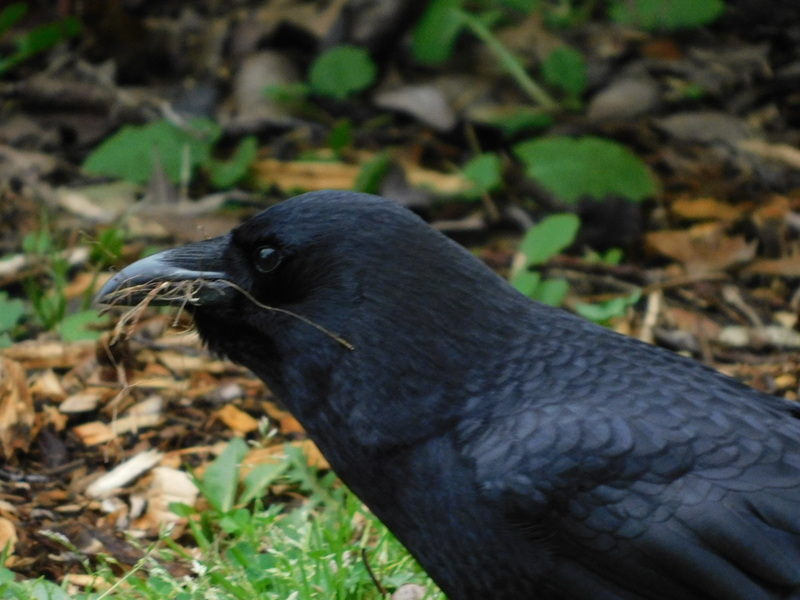 Well not literally, but if you see a crow with sticks or grass in their mouth they are not eating it. Just follow them to the tree they drag it into. There is a good chance they are building up in the top of that tree. Here are two examples of this behavior. First one is a male crow in Lincoln Park. I can tell he is a boy because his head feathers are almost like he is wearing a hoody plus the little beard under his chin. This guy is working on the grass part so they must be close to finishing it. Never did see where he went. He was close to the trail and right after I got this picture someone came along. You know this crow disappeared just like that. Then right outside my window here is a stick connoisseur. Never saw where he went. I think this crow is one of the pair that had babies in the pine tree outside my window last year. Better yet than a still photo is this little short video showing off his treasure hunting. So much for the stick as a way to find a nest. Not a lot of luck this year but maybe my luck will change. That brings me to the other way. That is to listen for that special baby crow cry. It sounds like “mama mama” with a caw twist. 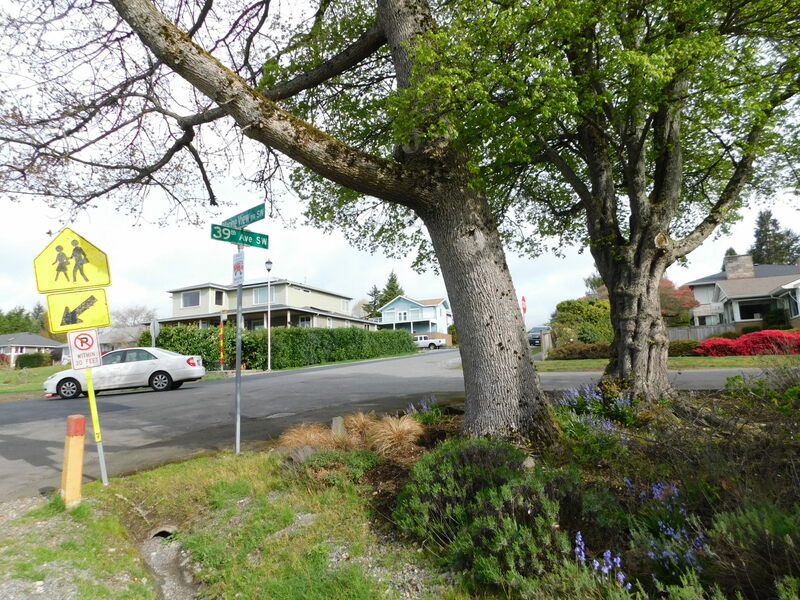 As walking around 39th SW & Marine View Drive I heard a little one. I walked around to MVD thinking he must be up in the fir trees. Kept listening and watching but to no avail. Then I heard that the sound was coming from behind me. Like zeroing in on a cell phone location, I started to triangulate where it was. 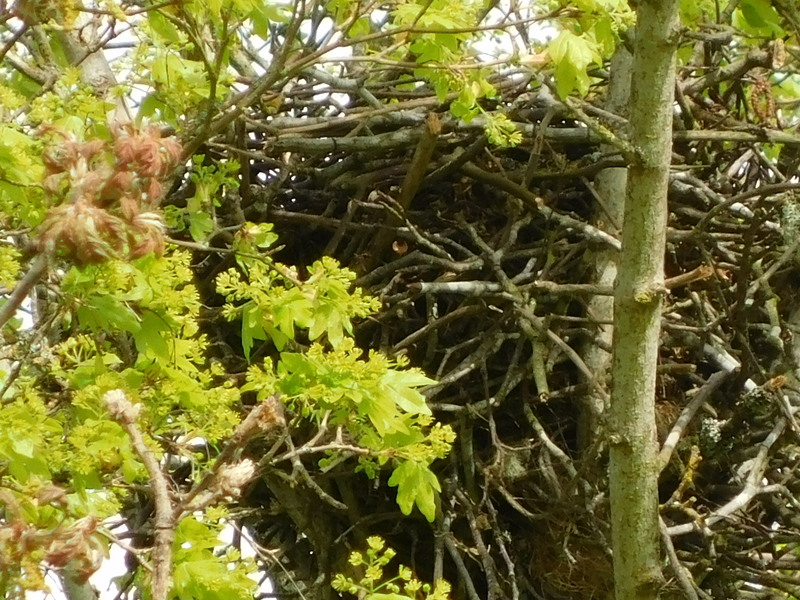 To my astonishment I found the nest in a deciduous tree. Not unheard of but fir trees are really crow’s tree of choice. 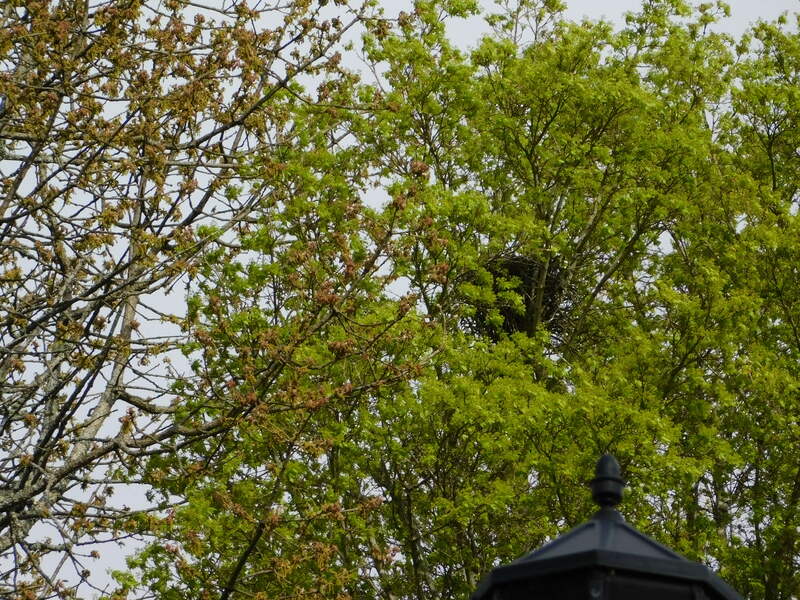 Here is a good distance look at the nest up at the top of the tree. It is right above the light pole. If you just follow straight up the pole into the tree you will see it. See the dark area above the light? that is the nest. How about a little closer? Now you can start seeing the shape. 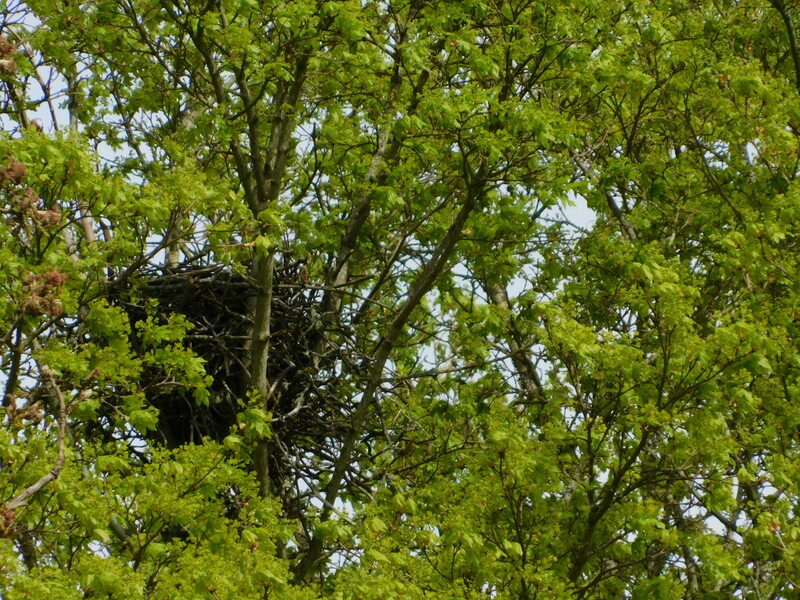 When I first saw the nest, I saw a crow sitting on the nest with my binoculars. I don’t think the pictures capture it. It is a big nest. The tree does not give it a lot of cover or support, so these crows worked hard to get it sturdy for their brood. Lot of sticks went into this crow nursery. Finally – a close up so you can see the heavy lumber they used. I call it lumber when you think a crow lugged this up there. 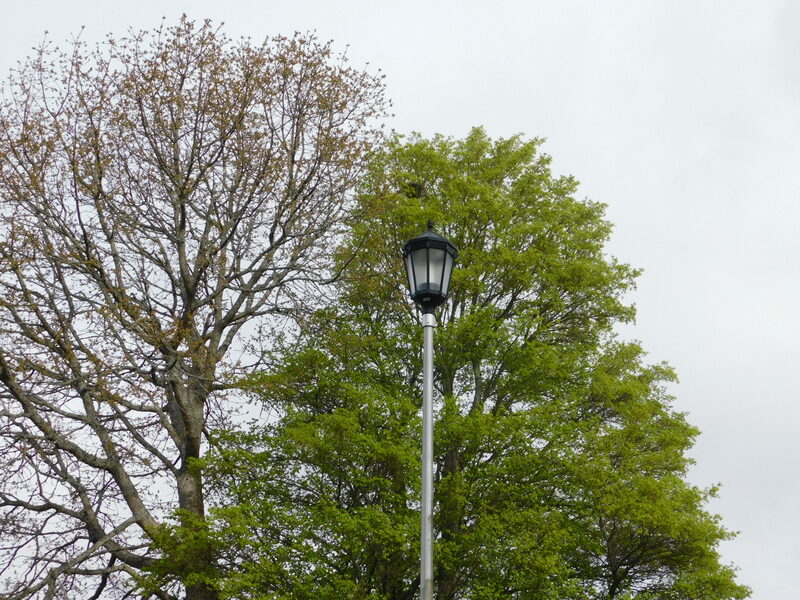 Plus here is a post on a crow nest as it is built over time. Wow what an intricate nest! Your camera is amazing. I don’t think I’ve ever seen a crows nest before now. I enjoyed the video, too.